For some reason, I have long associated Neil Gaiman with the masterful storytellers of old. Not necessarily Shakespeare, though Gaiman does have a unique writing voice that basks quite comfortably between poetry and prose. Maybe dead-center between Dickinson’s nebulous metaphors and Palahniuk’s gut-churning and pulse-racing straightforwardness. In my head, Gaiman joins the ranks of the literary colossi that aspiring fantasy writers look up to. Gaiman is among those rare breed of writers who can gather existing ideas and create something uniquely their own. In American Gods, Gaiman plucks out his characters from the pool of forgotten deities, breathing new life into each one to partake in this fast-paced and epic novel. The story commences the way most novels today begin, with an empty-handed protagonist with seemingly nothing to live for. Shadow, our unlikely hero, is a 30-something convict, who patiently counts the days to his release from prison. He promises himself, no more shenanigans. All he wants, after all, is to spend the rest of his life in quiet anonymity with his pretty wife, Laura. A day or two before he gets out, he receives news that his beloved wife has been killed in a car accident, alongside his best friend, who had promised him a steady job after Shadow’s stint in jail. His release date is pushed forward to allow Shadow to attend his wife’s funeral. En route to Laura’s burial, he meets a strange and pushy conman, who calls himself Mr. Wednesday. He offers Shadow a job, which our protagonist tries to turn down. A series of unsettling events that culminate in drunken fisticuffs with an odd fellow, who calls himself Mad Sweeney, has Shadow finally agreeing to become Wednesday’s bodyguard. Shadow soon learns that there’s much more to his employer than he lets on. As they travel across America, he discovers that Wednesday is no mere mortal. The odd and ageless conman is apparently a manifestation of Odin, the Old Norse All-Father. Wednesday had employed Shadow to help him recruit American incarnations of the almost-forgotten gods of ancient mythologies, to help him fight a war against the continent’s “new gods.” Like Wednesday/Odin, many of these “old gods” appear to be fading in existence as the people’s belief in them wanes over time. Shadow meets many of these antiquated idols, including Czernobog, Mad Sweeney (Suibhne), Mr. Nancy (Anansi), the Zorya Sisters, Mr. Jaquel (Anubis), and Mr. Ibis (Thoth). Although these deities recognize the danger posed by the “New American Gods” – Media, The Technical Boy (Technology), The Black Hats (Men in Black), and the Intangibles—most of them are reluctant to partake in Wednesday’s risky war. They would rather fend for their existence by gaining worship from mortals by any means possible. Wednesday, who appears to be always one step ahead of every situation, wrangles Shadow into an agreement that should he perish, Shadow would be the one to hold his vigil—which includes a reenactment of Odin’s time hanging from a “World Tree.” To avoid further bloodshed, Wednesday agrees to meet with the “new gods,” but is murdered in the process. This act of Wednesday’s ‘sacrifice’ is enough to rally the rest of the “old gods” to participate in one final, epic battle against the “new gods.” As Shadow holds vigil for Wednesday/Odin, he discovers that he was a mere pawn in Wednesday’s pursuit of power. It is now up to him to put a stop to the carnage that lies ahead for all the deities participating in the war. There’s a special place on my bookshelf for all things Neil Gaiman. Because, save for a few shorts, which I found to be so-so, I generally enjoy everything that Gaiman releases. Like Nick Hornby and Chuck Palahniuk (except for Pygmy), Gaiman is a go-to when I find myself yearning to devour stellar fiction. 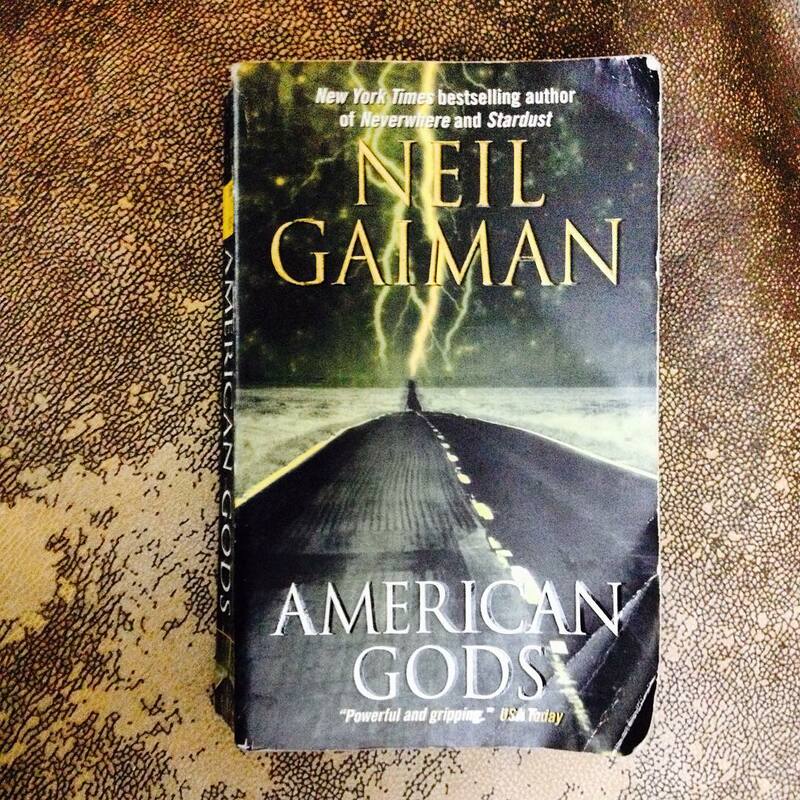 Though not my favorite work from the author, American Gods provided a very satisfying reading experience. I don’t think I need to gush about the book’s tone and research, as the author is very adept in both. Perhaps the minor grievance, (for I assure you, reader, it is very minor), that I have about the work has to do with its characters. In terms of character development, I’ve found Shadow, Wednesday, Mr. Nancy, Laura, and even Loki, to be very well-written, very fleshed out. But I also thought the piece to be a bit too convoluted, visibly crammed with deities I didn’t have time to fully appreciate. At times, the novel read like a who’s-who of ancient mythology. Ultimately, it doesn’t matter, I suppose. As I do love American Gods. And I do recommend it to every literature hound that’s come across this post. No! I’ll check it out. Thanks!